PHILADELPHIA -- Haason Reddick is coming home to go after Carson Wentz. The rookie linebacker returns to the field where he starred in college when the Arizona Cardinals (2-2) visit the Philadelphia Eagles (3-1) on Sunday. Reddick, who grew up in nearby Camden, New Jersey, was a walk-on at Temple. He rose to become the No. 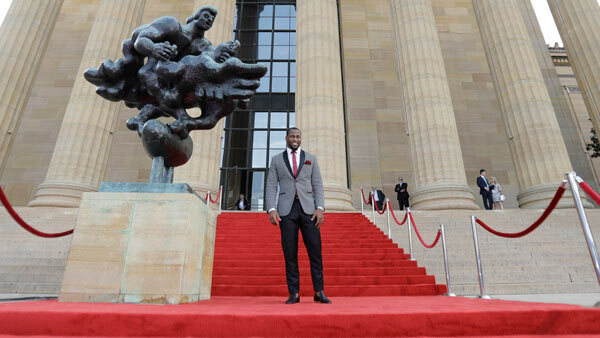 13 pick in the NFL draft, which was held in Philadelphia. "When my name was called, the response was crazy," Reddick said. Temple's Haason Reddick expected in first round. Jeff Skversky reports during Action News at 6 p.m. on April 24. Reddick expects a large number of family and friends cheering for him at the Linc. How will the rest of the Eagles fans react? "I think the crowd will be welcoming, but we'll see what happens," Reddick said. "You never really know with the Philly crowd. The Philly crowd has always been a wild crowd. Philly will always be home. I'll always have love for Philly." Reddick has 10 tackles in four games but is still seeking his first sack. He'll get a chance to rush the quarterback more this week because he's moving from inside linebacker to the outside spot to replace the injured Markus Golden . "Whatever the team needs, I'm willing to do, whether it's taking snaps at outside or getting reps at inside," Reddick said. "Pass rusher is more natural. I'm getting back into the groove and being focused on pass rushing, making sure I'm being a smart pass rusher." THE CARSONS: It'll be up-and-coming Wentz facing the veteran Carson Palmer. Neither quarterback has eye-popping stats, but Wentz has certainly improved in his second season. He's making fewer mistakes, not forcing the ball, and using his legs to convert key first downs. Palmer has played much better in the last three games after tossing three picks in Week 1. He has thrown for over 325 yards in each of the past three games with five TDs and two interceptions. COVERING FITZ: Larry Fitzgerald has torched Philadelphia's secondary throughout his career. He has 50 receptions for 845 yards and 11 touchdowns in eight meetings, including an NFC championship game. Philadelphia has the third-worst pass defense in the league and is missing top cornerback Ronald Darby, but defensive backs Jaylen Watkins and Corey Graham are returning from injuries. "He is a tremendous receiver," Eagles coach Doug Pederson said. "He's a pro's pro, the way he prepares himself during the week to play. Where he is in his career, it's a great testament to him. Seems like he keeps getting better. He's very steady in what he does." PROTECTING PALMER: Arizona's injury-plagued offensive line has allowed 12 sacks in the past two games and a league-high 17 overall. The Eagles' ferocious pass rush had eight sacks in the first two games but only two in the past two games because Eli Manning and Philip Rivers got rid of the ball quickly. Palmer holds the ball longer because the Cardinals like to throw vertically so Philadelphia's front four should get plenty of chances to bring him down. UP TEMPO: The Cardinals are considering using the no-huddle offense a bit more. Their only TD last week came when they went to a hurry-up offense. This approach can help to keep the defense off-balance and prevent substitutions so Palmer may get better protection. "It puts a good stress on the defense," Palmer said. "Defensive linemen get tired, pass rush slows down a little bit, it makes it a little more difficult to get to some of the packages where you get some crazy fire zones or some different looking coverages." KICKING GAME: Eagles rookie Jake Elliott has made six straight field goals, all longer than 40 yards, including the 61-yarder to beat the Giants in Week 3. Elliott is 8 for 10 overall and 7 for 7 on extra points. Cardinals veteran Phil Dawson is 9 for 12 with two misses under 40 yards, and 5 for 5 on extra points.